Palliser, Bayview and Pumphill residents are actively engaged in their community and keeping them informed is our top-priority. 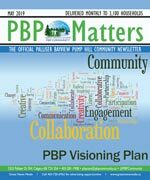 PBP Matters is the official community newsletter, and covers community news and is published monthly to keep content current and relevant. Delivered to every household, apartment, and business, every resident is acquainted with the community’s most important information. The Palliser Bayview Pumphill Community Association promotes community spirit and encourages all residents to contribute and participate in commmunity life. The volunteer Board of Directors deals with the day to day operations involved with running the community centre. It facilitates various events throughout the year. Our co-operative preschool has been operating since 1975 and is an integral part of our services. In the City of Calgary's 2012 municipal census, Bayview had a population of 682 living in 249 dwellings, a 5.2% increase from its 2011 population of 648. With a land area of 0.4 km2 (0.15 sq mi), it had a population density of 1,710/km2 (4,400/sq mi) in 2012. It is one of Calgary's wealthiest communities, with residents having a median household income of $184,383 in 2000 (the highest in the city). As of 2000, 15.1% of the residents were immigrants. All buildings were single-family detached homes, and none of the housing was used for renting. For more detailed info visit the City of Calgary community profiles site.